Intervista begins wiht a Japanese television crew arriving at the studio early to be able to watch Fellini as he starts shooting a new film, which is said to be an adaptation of Kafka's Amerika. Fellini tells the journalist that when he has a young journalist himself, he had come to Cinecittà to interview a great star. The Director’s memories are mingled with the interviewers’ questions, who are shooting everything. Fellini interviews the star, while his current director assistant is looking for new faces in the underground. Then policemen arrive, as they’ve been informed by a telephone call that a bomb has been put there. Marcello Mastroianni - dressed up as Mandrake the Magician - comes in. His magic wand recalls La Dolce Vita’s images, while attendants clap and Anita Ekberg cries. The following day America shootings are resumed, but they have to be stopped because of a hurricane. Some American Indians attack Cinecittà and use TV antennas as if they were spears. The film shootings end, and everyone wishes each other Happy Christmas. ‘I’ll never get tired of thanking Anita Ekberg and admiring her. She’s witty, wise and humble. It was so kind of her to accept her role in Intervista. It differs so much from her triumphant role in La Dolce Vita and I was moved. On that occasion Marcello and I went to see her in her house at the Castelli Romani, where she lives as a rural deity, serene, calm and imperturbable, without being minimally disturbed by the passing of time. Maybe I was a little cruel to her, but it wasn’t my intention’. A second reading of the film confirms the impression we got in Cannes. 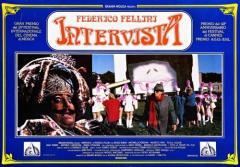 Intervista is the outcome of Fellini’s awareness. Maybe due to the black mood he’s been in for a long time (as he is getting old and has hard feelings towards Television channels, even though he is forced to work with them), or to his creative impulse, he recalls all the painful and funny insights of his mythology and makes jokes about it. It was said that Intervista is Otto e mezzo with Fellini in person replacing Mastroianni: much less sentimental problems and more wisdom. But it is the wisdom of an old clown, who’s able to ‘smile to life and all its contents’ (to quote Zeno Linksys, who imitated Charlot himself). Federico smiles at the way Japanese people try to steal his ultimate truth. He smiles at Marcello Matroianni and Anita Ekberg, who’s ageing (that ageing is exaggerated on purpose) and compares them to their charismatic images in La Dolce Vita. He smiles at the accidents occurring while making the film. But he smiles at us too, as we believe all these fantasies and take them for absolute realities. Intervista is s page of an apocryphal diary full of real feelings: changing times, threat of a barbarian future (television equaling an American Indians’ assault), an illegible past (Fascism and his cinema) or turned into a myth (being young). 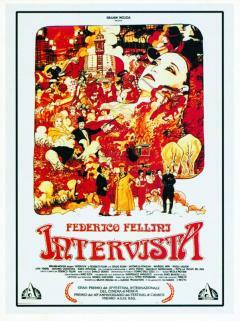 Intervista is a superb cinema lesson from every point of view. All film-making expressive media are splendidly used here. Fellini is constantly behind and in front of the camera. 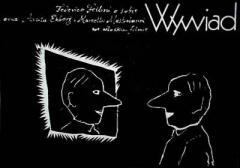 Fellini thinks and makes auditions for an hypothetical movie inspired by Kafka’s America. Fellini recalls when he was a journalist and visited Cinecittà for the first time. Cinema is conceived as ‘death at work’, because in the get-together of Fellini, Mastroianni and Ekberg or ‘Anitona’ in La Dolce Vita – this old saying that had been attributed to Cocteau still holds true. To understand and love Intervista we have to know how it originated: it was conceived as a television program, then became a TV-movie and finally a real movie to be screened in cinemas. It’s a little movie, in a sense, but it is graceful and lively. Of course we may say ‘we’ve already watched it’. But this would be unfair, as we enjoy it so much. Said statement can be made only by those who did not want to enjoy its joyful rhythm. This is a film by a film-maker who does no longer need to either confirm his talent or justify his contradictions.